On Friday night, Justise Winslow continued his fourth season renaissance, as the Miami Heat stomped on the Cleveland Cavaliers to the tune of a comfortable 118-94 win. Winslow finished the game with an eye-catching stat-line: 24 points, 11 rebounds, 7 assists, and only 2 turnovers. While the Cavs are a veritable nightmare of a team ever since some dude they used to employ left to the Los Angeles Lakers, Winslow’s development over the last month has been a dream for Miami. When starting point guard Goran Dragić was shut down for surgery earlier in December, the Heat suddenly found itself with no one to run the offense. Enter Winslow. He’s averaging 15.2/5.5/4.1 in his last 12 games, six of those as the team’s point guard, as the Heat have reeled off a 9-4 December, with statement wins over playoff teams like the Rockets, the Clippers, and the Bucks. With that stretch, they’ve climbed back into the morass at the bottom of the Eastern Conference’s playoff picture, currently sitting in seventh with a 17-17 record. It’s not just that Winslow has been given more responsibility as the conductor of the Heat’s offense. The rest of his game has been boosted by having the ball in his hands more often. Despite coming into the league as a shooting non-entity—even the most optimistic of observers for his potential acknowledged he needed to fix his shot to be a true star—Winslow has been a legitimately good shooter for two seasons now. Last year, he shot 38 percet from deep, and while that’s dipped (very slightly) to 37.5 percent this year, he’s doing it on 3.6 attempts per game, which would easily be a career high. He’s also finishing at the rim at an above-average rate, particularly in December: per the Miami Herald, Winslow is finishing 65.9 percent of his attempts at the rim this month, compared to 54.5 percent last season. His shot distribution has also finally skewed towards modern NBA trends; he’s taking 34.3 percent of his shots from three, which, combined with his steady improvement from deep, has seen his true-shot percentage rise to a career-high 50.9 percent this season. Interestingly, the game that best exemplified the new Winslow was a loss, the only one during his stint as the Heat’s point guard: a two-point defeat at the hands of the East’s best team, the Toronto Raptors. On Boxing Day, Winslow went toe-to-toe with Kawhi Leonard down the stretch, nailing a pair of fourth quarter three-pointers to help push back a violently efficient run by the East’s best team. Unfortunately for Winslow and the Heat, he still does not out-rank Dwyane Wade on the clutch time hierarchy, as the outgoing retiree’s potential game-winner clanged off the rim before Winslow rushed an off-balance three that also missed. Maybe the craziest part of Winslow’s surge this year is that most Heat fans would have wanted him taking the final shot, instead of the franchise’s best-ever player. On the other side of the ball, Winslow is still just as good as ever; despite being generously listed at 6-foot-7—he’s probably closer to 6-foot-5—he’s guarded every position on the court, oftentimes in the same game. Ever since Spoelstra started implementing the zone defense earlier this month—another adjustment made due to the lack of healthy guards and an abundance of long-armed forwards—Winslow has been the linchpin, helping to anchor the top of the 2-3 zone that has confounded their December opponents into careless mistakes and the mid-range jumpers so out of vogue with today’s NBA. Winslow’s not perfect, of course; he still plays more than his share of possessions like a clueless tornado, and his turnovers have jumped up a full point since last season. His shooting, while overall very good now, still goes cold more often than you’d like; if his rhythm starts off, the Heat will be in for a long game of bricklaying. 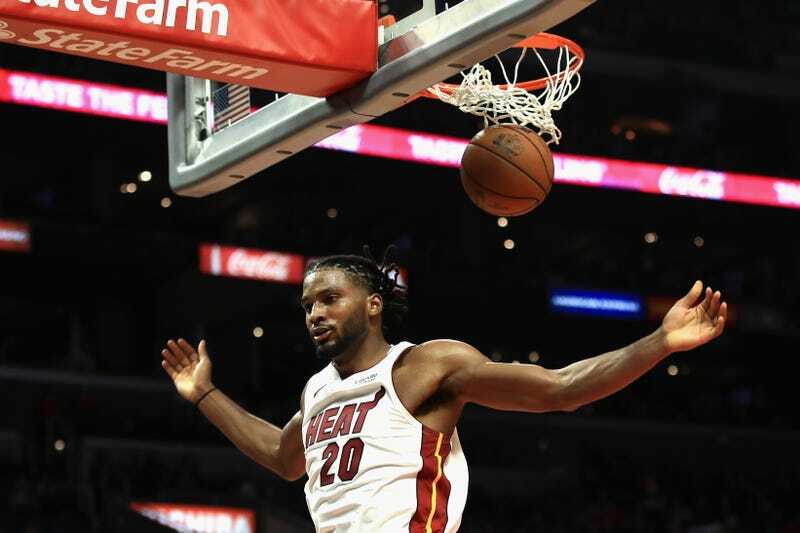 By letting him loose with the ball, Spoelstra has unlocked the part of Winslow’s game that had been lacking in his short NBA career and, in turn, Winslow has likely saved the Heat from the ignominy of the tanking Olympics at the bottom of the league.